You are here: Home 2012 May How to Configure Cisco PIX Firewall? How to configure a new PIX firewall? You will need to will configure passwords, IP addresses, network address translation (NAT) and basic firewall rules. If you have a new PIX firewall that has never been configured, it will need to be configured with some basic IP addresses, security and a couple of basic firewall rules. 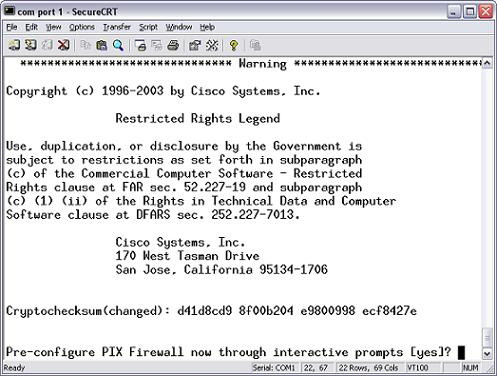 You also have never used a PIX firewall before. How will you be able to perform this configuration? After reading the following tips, you will be clearer about it. A Cisco PIX firewall is meant to protect one network from another. There are PIX firewalls for small home networks and PIX firewalls for huge campus or corporate networks. In this example, we will be configuring a PIX 501 firewall. The 501 model is meant for a small home network or a small business. PIX firewalls have the concept of inside and outside interfaces. The inside interface is the internal, usually private, network. The outside interface is the external, usually public, network. You are trying to protect the inside network from the outside network. PIX firewalls also use the adaptive security algorithm (ASA). This algorithm assigns security levels to interfaces and says that no traffic can flow from a lower-level interface (like the outside interface) to a higher-level interface (like the inside interface) without a rule allowing it. The outside interface has a security level of zero and the inside interface has a security level of 100. Notice the ethernet0 interface is the outside interface (its default name) and the security level is 0. On the other hand, the ethernet1 interface is named inside (the default) and has a security level of 100. All passwords should be set to “cisco” (in reality, you make these whatever you want, but not “cisco”). The inside network is 10.0.0.0 with a 255.0.0.0 subnet mask. The inside IP address for this PIX should be 10.1.1.1. The outside network is 1.1.1.0 with a 255.255.255.0 subnet mask. The outside IP address for this PIX should be 1.1.1.1. You want to create a rule to allow all inside clients on the 10.0.0.0 network to do port address translation and connect to the outside network. They will all share the global IP address 1.1.1.2. However, clients should only have access to port 80 (Web browsing). The default route for the outside (Internet) network will be 1.1.1.254. You will be prompted to answer YES or NO as to whether or not you want to configure the PIX through interactive prompts. Answer NO to this question because you want to learn how to really configure the PIX firewall, not just answer a series of questions. You now have administrative mode to show things but would have to go into global configuration mode to configure the PIX. Notice that the prompt changed to the name that you set. This is the password required to gain any access to the PIX except administrative access. Now, configure the enable mode password, used to gain administrative mode access. Note that you can do a show interfaces command, right from the global configuration prompt line. The PIX firewall can, of course, support dynamic routing protocols as well (such as RIP and OSPF). With this, all inside clients are able to connect to devices on the public network and share IP address 1.1.1.2. However, clients don’t yet have any rule allowing them to do this. NAT (Network Address Translation or Network Address Translator) is the translation of an Internet Protocol address (IP address) used within one network to a different IP address known within another network. One network is designated the inside network and the other is the outside. Typically, a company maps it’s local inside network addresses to one or more global outside IP addresses and unmaps the global IP addresses on incoming packets back into local IP addresses. This helps ensure security since each outgoing or incoming request must go through a translation process that also offers the opportunity to qualify or authenticate the request or match it to a previous request. NAT also conserves on the number of global IP addresses that a company needs and it lets the company use a single IP address in its communication with the world. NAT is described in general terms in RFC 1631, which discusses NAT’s relationship to Classless Inter domain Routing (CIDR) as a way to reduce the IP address depletion problem. NAT reduces the need for a large amount of publicly known IP addresses by creating a separation between publicly known and privately known IP addresses. CIDR aggregates publicly known IP addresses into blocks so that fewer IP addresses are wasted. In the end, both extend the use of IPv4 IP addresses for a few more years before IPv6 is generally supported. These clients on the inside network have a NAT translation, but that doesn’t necessarily mean that they are allowed access. They now need a rule to allow them to access the outside network (the Internet). That rule will also allow the return traffic to come back in. Note that PIX access lists, unlike router access lists, use a normal subnet mask, not a wildcard mask. With this access list, you have restricted the inside hosts to accessing Web servers only on the outside network (routers). Now that you have configured the PIX firewall, you can show your configuration with the show run command. Make sure that you save your configuration with the write memory or wr m command. If you don’t, your configuration will be lost when the PIX is powered off.